A story of traveling into the deserts of southern California and finding a small highway town that was born out of a dream. It was twilight when we approached Amboy driving west on the National Highway. Seeing the doors to the old cabins open we pulled off the road. Candy started taking pictures while I stuck my head in one of the cabins; it was maybe fourteen feet square, just one room with a small bathroom and an ancient looking wall heater. Fifty yards to the east was the Amboy School, now deserted and protected by a chain link fence. 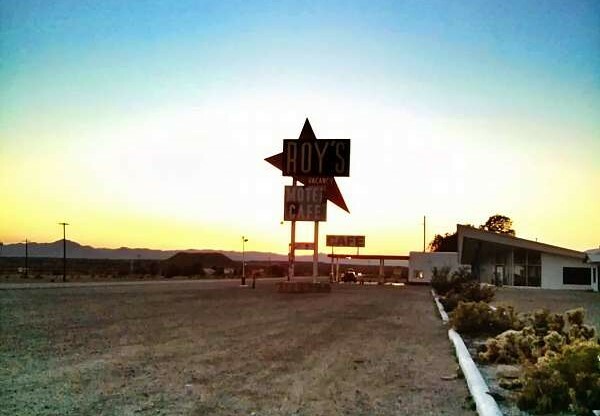 A couple hundred yards to the west was a filling station and Roy’s Motel and Cafe. We were there twenty minutes and maybe half a dozen cars passed by. Not a bad count for an obscure, desert road but disappointing for a town that had been shaped out of such a big dream. 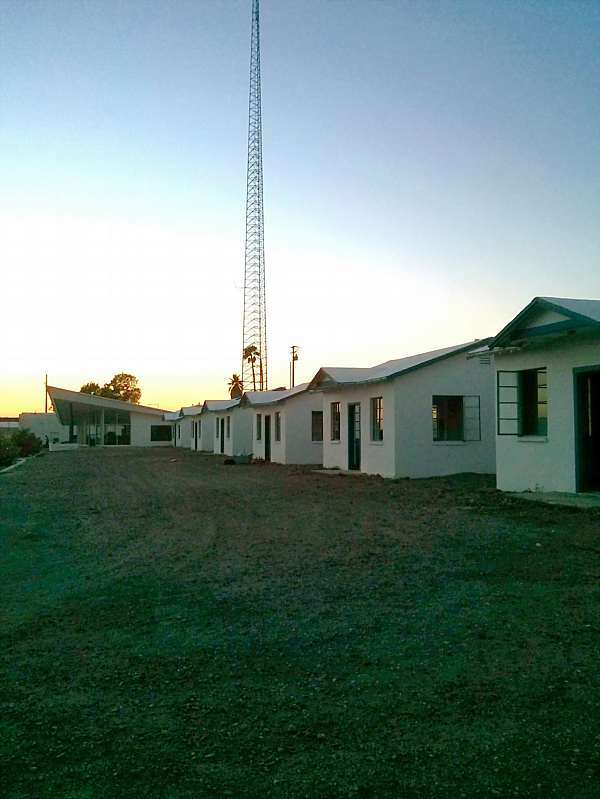 In the late 1930s the gas station was opened by Roy Crowl who became partners with his son-in-law Herman “Buster” Burris a few years after that. It was Buster that had the dream, running power himself from Barstow. At its peak the town had 700 residents and Roy’s employed 70 people. 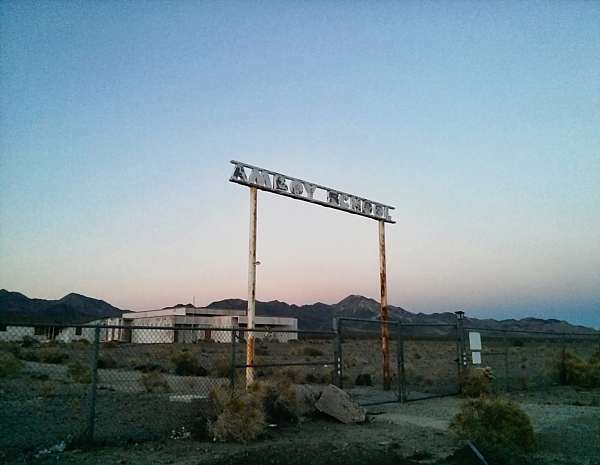 When Interstate 40 was completed in 1972 so began the slow death of Amboy. Rather than see what he had poured his life into be slowly lost to the desert, Buster bulldozed most of the town himself. Thirty years passed. Buster retired and eventually died. Investors came and went and at one point the entire city was for sale on EBay. It is currently owned by Albert Okura, owner of Juan Pollo chain of restaurants. According the the Juan Pollo website, Mr. Okura plans to reopen the restaurant and motel. That was in 2011; three years later those facilities remain closed. As we pulled back onto the remains of old route 66, I wondered if Amboy would be granted its rebirth or if that would remain yet another unrealized dream. Two miles to the west of town is the Amboy Crater. When smoke was spotted curling from the dormant volcano in the mid-forties, both the highway and the railroad were closed for 72 hours. The panic only dissipated when a plane was brought in from Los Angeles and the smoke was revealed to be an elaborate prank by some high school students. Pulling onto the one lane road up to the crater I thought about those kids. They were probably bored and frustrated; strung out on the impatient itch of youth and feeling stuck in a small, dusty town as cars passed through to Los Angeles or Chicago or any other big city along US 66. Too young to have fought in the war and not bold enough to set out for the big city, they dragged a bunch of old tires and lumber up to the crater and played one of the best high school pranks ever. A family was setting up camp as we walked up the path to the viewing area. It was getting dark but we still climbed the fence and set off across the rocky ground strewn with lava. Stars were emerging in the darkening sky like bright eyes opening. A few minutes from the campground the quiet and still was unearthly. Looking up at the crater it was easy to imagine we were on another planet. The beauty was profound as was the solitude. Both of us just stood there for several minutes without speaking, not wanting to leave but realizing with night comes a sharp chill to the desert. Walking back I thought about those teenagers starting that fire in the crater, I also thought of Buster. Legend has it when he came to the area for the first time he blurted out “Who left the oven on? !” Despite that first response he fell deeply in love with place and spent all his time and energy on a dream that was probably doomed from the beginning. I see him out there, driving a battered Studebaker pickup stringing wire onto poles in order to bring electricity to Amboy, and I understand him. The desert is not for everyone. For most people it is a place to pass through in a hurry or to get lost in and perish. For some of us like Buster, there is a different sort of getting lost; lost in a harsh yet magical land that few understand. It is a land of fires, and a land of dreams. Izaak Diggs is a freelance writer based in Portland, Oregon. He is currently at work on a book focusing on the deserts west of the Rocky Mountains. His website is here. Izaak Diggs has written 3 posts on Vagabond Journey. Contact the author. Huh, what an interesting story! For sure. There are more stories than people out in deserts.